New 2013 population estimates for cities and sub-county areas show that each of the largest 10 U.S. cities has increased in population since Census 2010. Five of the ten largest population growth (2010-2013) cities are located in Texas. See more about these patterns and characteristics of cities population size and change below. This section provides tools to access/analyze the Census Bureau annually updated city/place population estimates from 2010 through 2013. See corresponding Web section for more details and interactive table. Use the CV XE GIS with city/place GIS project to examine characteristics of city/place population, 2010-2013. The following view shows patterns of population percent change, 2010-13, by city (cities 5,000 population or more) the Phoenix-Tucson area. Click map for larger view and details. Members of the ProximityOne User Group (see below, no fee) may download the GIS tools and project to develop similar city/place pattern views. Create a similar map view for any area in the U.S. … one city, a county, metro, state, etc. Add other types of geography and data. Label in different ways. Choose alternative subject matter items to map and different interval/color settings. Create graphics to add to reports, stories, web pages, etc. Use the interactive table to view, compare, rank U.S. cities and population characteristics and trends, 2010-2013. Use the StCty query below the table to examine how the population for a selected county is changing overall and how it is changing by city within the county. 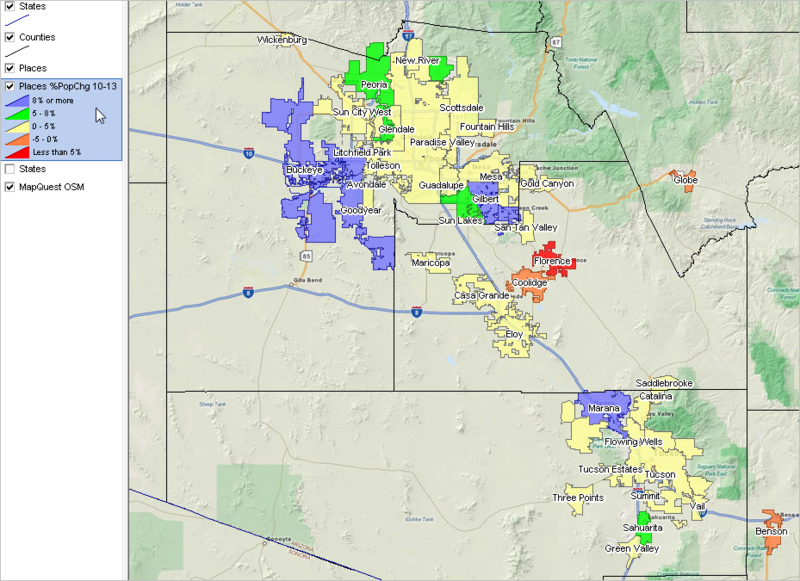 The following graphic (view of the table above) shows cities located in Pima County, AZ (Tucson). Marana has increased the most since Census 2010. See Marana in this map view. Marana is located in the northern part of Pima County. City/place data in this section are for incorporated cities. Some cities are located in more than one county. The graphic below illustrates how the city of Houston, TX is located in 3 counties and predominantly in Harris County. The row with geolevel 162 is the total incorporated place and corresponding total population. The other rows are for geolevel 157 and show those parts of the city in the county-separate components. For those rows with geolevel 157, the StCty column shows the state-county FIPS code. Use the scroll section above to view the county name corresponding to the StCty code. Incorporated Cities/Places. The legal designations, powers, and functions of incorporated places vary from state to state. Incorporated places include cities, towns (except in New England, New York, and Wisconsin), boroughs (except in Alaska where boroughs are treated as equivalents of counties and New York where five boroughs comprise New York City) and villages. Incorporated places can cross both county boundaries. Population estimates for incorporated places in this section are for the city with boundaries as defined as of January 1, 2013. Learn more about accessing, integrating and using data for cities/places. Join us in a Decision-Making Information Web session. There is no fee for these one-hour Web sessions. Each informal session is focused on a specific topic. The open structure also provides for Q&A and discussion of application issues of interest to participants. 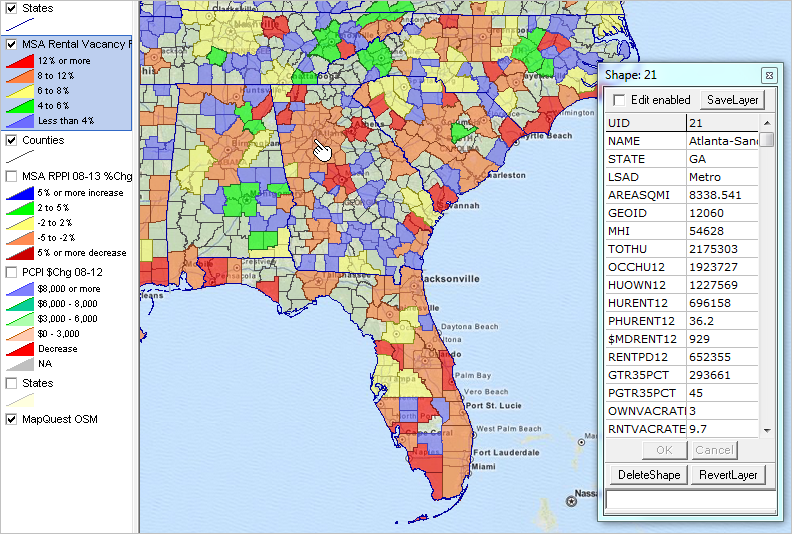 See more about city/place geographic-demographic-economic characteristics at http://proximityone.com/places.htm. Rental housing is among the top items on the national housing agenda. The past 30 years have witnessed a housing policy that has been focused on promoting homeownership. The large gap between the number of renting households and the units that they can afford will grow as home ownership becomes increasingly scarce for all but the most qualified buyers and renter/owner preferences change. Rental housing is an important component of national and local housing policies. This section builds on Census Bureau data and provides resources to examine characteristics of the rental housing market for individual states and metropolitan areas. See related Web section with interactive table. The interactive table provides a selection of rental housing market attributes for each state and metro. This view shows the rental vacancy rate (RVR) in 2012 by MSA. Orange/red metros have higher RVRs, yellow metros are closer to the national RVR and green/blue metros have lower RVRs. Click graphic for larger view with details. This view shows 521 metros (MSAs and MISAs) — all 2010 vintage metros for which ACS 2012 1 year estimates were tabulated. See southeastern U.S. zoom-in view (shows mini-profile for Atlanta metro attributes). These views were developed using the CV XE GIS and metro GIS project. Members of the User Group may install the CV XE GIS and metro project and create related, augmented map views and perform related analyses. There is no fee. The rental vacancy rate is the percent of rental units that are unoccupied/available for rent. The rental vacancy rate is a factor in determining supply and demand in the rental market and is a component of the index of leading economic indicators. A high rental vacancy rate coupled with a low share of homes that are renter occupied generally implies more housing choices available for renting households. The share of burdened households can be lower in such markets. Conversely, a low rental vacancy rate in a market with a high percentage of renter households can signify a tighter rental market, fewer housing choices, and more affordability problems, particularly for low-income households. In these markets, the shares of burdened renters are often higher. Housing Costs … in 2012, median gross rent in the metro areas (metropolitan statistical areas) in the United States ranged from $522 in the Wheeling WV-OH Metro Area and the Wheeling, WV-OH Metro Area to $1,560 in the San Jose-Sunnyvale- Santa Clara, CA Metro Area compared with the national median of $884. Among the 366 metro areas, 280 (76.5 percent) had a median gross rent below the national median, 86 (23.5 percent) had a median gross rent above the national median. A comparison of all metro areas to the national median masks the tighter rental conditions faced by renters living in higher density metro areas. Renter Burden … nationwide, nearly 2 in 5 renter households (43.1 percent) were burdened by housing costs consuming 35 percent or more of their incomes. Housing cost burdens ranged from a low of 25.7 percent of renting households in the Jefferson City, MO Metro Area to a high of 57.9 percent of renting households in the Corvallis, OR Metro Area. Many of the metros (metropolitan statistical areas) with the higher cost burden is due to a relatively large student population. Renters living in 166 of the 366 metro areas (45.4 percent) were above the national rate. Rental Vacancy Rate … nationwide, the rental vacancy rate was 6.8 percent. The rates in the nation’s metro areas (metropolitan statistical areas) ranged from 0.3 percent in the Odessa, TX Metro Area to 38.1 percent in the Myrtle Beach-North Myrtle Beach- Conway, SC Metro Area. Excess rental inventory was almost equally likely to plague metro areas than the national rental housing market as a whole, with 180 (49.2 percent) of all metro areas having a rental vacancy rate below the national rental vacancy rate and 186 (50.8 percent) having vacancy rates at or above the national rate. Use the interactive table to view, rank, query, compare rental market conditions by state and metro. Join the ProximityOne User Group to keep up-to-date with new developments relating to metros and component geography decision-making information resources. Receive updates and access to tools and resources available only to members. Use this form to join the User Group. There is no fee. Learn more about metros, metro geographic drill-down, housing market demographic economic data and related analytical tools. Join us in a Decision-Making Information Web session. There is no fee for these one-hour Web sessions. Each informal session is focused on a specific topic. The open structure also provides for Q&A and discussion of application issues of interest to participants. … use tools described here to locate and view addresses on a map, code addresses from a file, attribute addresses with demographic-economic characteristics, create corresponding shapefiles, and more … essential to many decision-making information solutions. Site analysis tools are computer-based operations that enable the user to examine demographic, economic and other characteristics of elemental geographies (such as block groups) as a group or composite. Typically, the group of elemental areas is defined by a circle or a radius value in miles from an address or location of interest … a site with a 1-mile or a 3-mile radius, hence the term site analysis. All site analysis applications are focused on addresses/locations of interest. This section reviews use of the CV XE GIS Site Analysis tools for geocoding addresses and integrating those geocoded address into GIS applications. This is an enabling or first step in many GIS-based site analysis applications. More details on site analysis applications are reviewed in related sections. With CV XE GIS (5/12/14 or later version) running and your User Group ID entered in Settings, start the Site Analysis operation from the menu: Analytics>SiteAnalysis. The Site Analysis API (Application Programming Interface) makes use of API technologies to geocode addresses and assign Web-sourced demographic-economic attributes. On the SiteAnalysis form, the address coding operations are located in Tools>Find Address and Tools CodeAddresses. Operations reviewed here may be performed using the no fee CV XE GIS. Find Address. The Find Address operation enables you to enter an address that is then geocoded. The geocoded result is assigned a demographic-economic value selected by the user. In the following example, the user selects the ACS 2012 5 year median household income item. The geocoded result is converted into a shapefile, for optional permanent reuse, and also added to the existing GIS project. Upon clicking the Tools>Find Address button, the address prompt appears. This view shows the default address, but you can use any address. Click OK when ready for next step. The next prompt is for the ACS 2012 5 year subject matter item to assign to this address. This view shows the default “item name”, but you can use any ACS 2012 5 year item available at the block group level. The default item is “B19013_001E” (ACS 2012 5 year median household income). Click OK when ready for next step. The next prompt is for a second address. You can continue adding addresses manually. When done enter a null address as shown here. Click OK when ready for next step. A shapefile is now automatically developed and added to the GIS project. A default file name is used which you can change. You can choose to use the default file name and overwrite/reuse this name. The shapefile marker(s) are displayed in the map window as shown below. The idenify tool is used to click on the marker (red square marker) and display a mini-profile. 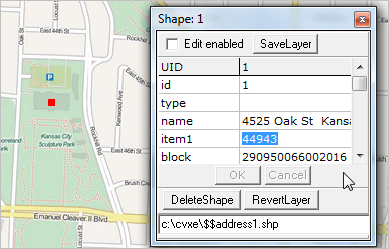 In the profile, the Census 2010 census block code is shown as a field in the shapefile dbf. This address is in Census 2010 census block 29-095-006600-2016. The address is located in a block group with ACS 2012 5 year median household income estimate of $44,943 as shown for the field “item1” in the profile. CodeAddresses. The CodeAddresses operation is similar to the Find Address operation. Rather than entering the addresses manually, the addresses are input from a file that you create. As with Find Address, the geocoded results are assigned a demographic-economic value selected by the user. In the following example, the user selects the ACS 2012 5 year median household income item. Like Find Address, the geocoded results are converted into a shapefile, for optional permanent reuse, and also added to the existing GIS project. Upon clicking the Tools>CodeAddresses button, the address input file name appears. This view shows the existing default input file, but you can develop your own with a text editor.. Click OK when ready for next step. As with Find Address, the next prompt is for the ACS 2012 5 year subject matter item to assign to this address. This view shows the default “item name”, but you can use any ACS 2012 5 year item available at the block group level. The default item is “B19013_001E” (ACS 2012 5 year median household income). Click OK when ready for next step. A shapefile is now automatically developed and added to the GIS project. The shapefile markers are displayed in the map window as shown below. In this example, the markers have been set to show the median household income value as labels (using the layer editor). This completes the review of using the Site Analyst API for address coding and shapefile development. Review related Site Analyst API section to see how these address coded files can be used for site analysis applications. Join the ProximityOne User Group to keep up-to-date with new developments relating to school and school district decision-making information resources. Receive updates and access to tools and resources available only to members. Use this form to join the User Group. There is no fee. Learn more about using community, school district and small area demographic-economic data. Join us in a Decision-Making Information Web session. There is no fee for these one-hour Web sessions. Each informal session is focused on a specific topic. The open structure also provides for Q&A and discussion of application issues of interest to participants. … this is Part 1 … watch for follow-on posts that extend on the topics reviewed here. See related Site Analysis API & Address Coding Web page for more details. .. examining metropolitan area dynamics … how will the market for single family homes in the Austin-Round Rock, TX metro change over the next 5 years? 20 years? How does the metro GDP in the Austin metro compare to others? What are the patterns in metro rental income and homeownership/vacancy rates? How are they trending? We examine these types of topics in this section. Stakeholders can replicate applications reviewed here for this and other metros using ProximityOne no fee resources. Metropolitan areas include approximately 94 percent of the U.S. population — 85 percent in metropolitan statistical areas (MSAs) and 9 percent in micropolitan statistical areas (MISAs). Of 3,143 counties in the United States, 1,167 are in the 381 MSAs in the U.S. and 641 counties are in the 536 MISAs (1,335 counties are in non-metro areas). This section is focused on the Austin-Round Rock, TX metro; Core-Based Statistical Areas (CBSA) 12420. It is not intended to be a study of the metro but rather illustrate how relevant decision-making information (DMI) resources can be brought together to examine patterns and change and develop insights. The data, tools and methods can be applied to any metro. The Austin-Round Rock, TX MSA is shown in the graphic below. The 5-county metropolitan statistical area is shown with bold brown boundary; counties appear with black boundaries and county name labels. The thematic pattern shows a measure of economic prosperity (median household income: MHI) by census tract. Click graphic for larger view with details; the larger view shows interval values associating MHI with income levels. Develop variations of this map view using the Mapping Texas Neighborhood Patterns GIS resources. The Census 2010 population of the metro was 1,716,289 (36th largest) compared to 1,883,051 (35th largest) based on the 2013 estimate. Metros of similar size include: Indianapolis-Carmel-Anderson, IN, San Jose-Sunnyvale-Santa Clara, CA, Nashville-Davidson–Murfreesboro–Franklin, TN and Virginia Beach-Norfolk-Newport News, VA-NC. See interactive table to examine other metros in a similar manner. Click here to view a metro by county profile for the Austin metro. Click the county component links below to view annual county population estimates and components of change. Use this interactive table to view demographic attributes of these counties and rank/compare with other counties. 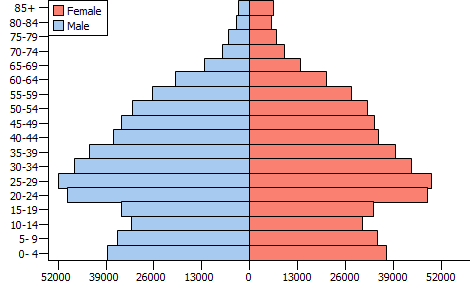 The graphic below shows the Census 2010 Travis County population pyramid. Click graphic to view as HTML section with related Census 2010 age-gender population distribution. Use ChartGraphics examine population by age-gender-race/origin for any county. In 2012, the metro median household income was $59,433, percent high school graduates 88.1%, percent college graduates 40.5% and 15.5% in poverty. In 2012, Austin-Round Rock had a per capita personal income (PCPI) of $42,902. This PCPI ranked 98th in the United States and was 98 percent of the national average, $43,735. The 2012 PCPI reflected an increase of 3.0 percent from 2011. The 2011-2012 national change was 3.4 percent. In 2002, the PCPI of Austin-Round Rock was $31,797 and ranked 86th in the United States. The 2002-2012 compound annual growth rate of PCPI was 3.0 percent. The compound annual growth rate for the nation was 3.2 percent. View selected Austin metro real per capita personal income (RPPI) patterns in this interactive table. The Austin metro 2012 RPPI is estimated to be $41,339. The metro ranks 127th among all 381 metros, between La Crosse, WI metro ($41,347) and Reno, NV metro ($41,329). View selected Austin metro Gross Domestic Product (GDP) patterns in this interactive table. The Austin metro 2012 GDP is estimated to be $98.7 billion. The metro ranks 32nd among all 381 metros, between Columbus, OH metro ($100.5 billion) and Sacramento, CA metro ($97.6 billion). School districts play an important role in the metro dynamics. See more about the school district community. Examine characteristics of the school age population by type of enrollment by school district. Use this interactive table to view/rank/compare all school districts. Austin ISD ranks 37th among the largest 100 U.S. school district based on the 2013-14 enrollment. See the Austin ISD focus section. Round Rock ISD is the 100th largest school district. See the Round Rock ISD focus section. See more about the largest 100 school districts. By definition, metropolitan areas are comprised of one or more contiguous counties. Metropolitan areas are not single cities and typically include many cities. Metropolitan areas are comprised of urban and rural areas and often have large expanses of rural territory. A business and demographic-economic synergy exists within each metro; metros often interact with adjacent metros. The demographic-economic makeup of metros vary widely and change often. See more about metros. Learn more about using resources described in this section. Join us in a Decision-Making Information Web session. These no fee, informal one-hour Web sessions focus on selected specific topic. The open structure provides for Q&A and discussion of application issues of interest to participants. We can address your specific questions about using metro, county and geographic drill-down demographic economic data and related applications. .. planning, gathering insights and decision-making information for the school district community … the “school district community” shares the same geographic boundary as the school district. Yet, the school district community is broader than the schools, students and educational infrastructure. It is comprised of the total population living within the school district. The school district community includes all of the housing, transportation facilities, security, recreational resources, and businesses within the school district boundaries. The geography of the school district is often different than the related city or county. … selected attributes about the Boston Public Schools school district ..
.. ACS 2012 5-year median household income for district overall: $53,136. View developed using CV XE GIS and Massachusetts DMI GIS Project. Click this link to view detailed 5-part demographic-economic characteristics for this school district. See related Boston community profile. See related Suffolk county projections to 2020. May 13 School District Community Webinar — Join us! Join us in this no cost one-hour session — register. Register for the May 13 Webinar. .. determining “where we are now” and “about recent trends” … what is the natural increase (population change due to births less deaths only, without considering migration) in the population from year to year or over several years, for counties/regions of interest? Does the county net migration reflect population moving in or out? Is there a migration pattern/trend? What factors are responsible for migration? To know about these patterns, characteristics and trends, requires annual, up-to-date population estimates. 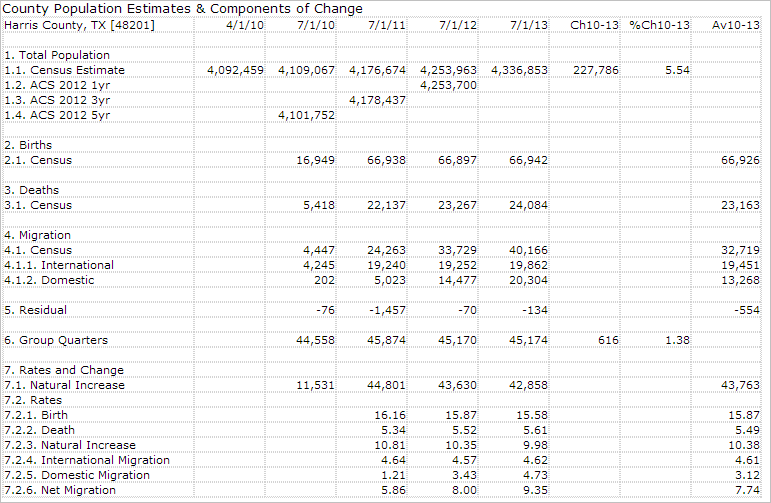 The following graphic shows population estimates and components of change for Harris County, TX. Similar profiles are available for all counties; read on. Each year the Census Bureau develops model-based estimates of the population by county. The post-census estimates are intended to provide updates to Census 2019. The estimates provide an update and more current picture of the population size, composition and how it is changing. In March 2014, the U.S. by county July 1, 2013 population estimates and components of change became available. In June 2014, the U.S. by county July 1, 2013 population estimates with breakouts by age, gender and race/origin will become available. The model-based estimates, also referred to as synthetic estimates, are separate from the annual American Community Survey (ACS) data that provides similar annual population estimates. This section is the first of four parts focused on the structure/content, access, use and evaluation of the annual Census Bureau model-based county population estimates. This section is focused on the structure/content and access to the population estimates and components of change. The next section (June) will focus on age and race/ethnicity detail. The third section (July) will focus on use: interpretation, geospatial/visual pattern analysis/mapping with GIS tools and time series/trend analysis. The fourth section (August) will focus on comparing the Census Bureau model-based estimates to alternative estimates. Use the interactive table to examine the Census 2010 population (4/1/2010 column) and annual population estimates (7/1/2010 through 7/1/2013) for all counties and metros. Each row presents the same population estimates and components of change data as shown in the profile at the top of this section. The standalone county profile will be expanded in related (upcoming) sections to show 1) alternative estimates and components of change and 2) addition of population estimates by age, gender and race/origin. County profiles are available for any county by clicking the link in the interactive table. The Census Bureau model-based estimates will update with 2014 estimates scheduled to become available in March 2015. While these tables show data developed by the Census Bureau, most of these data are available only in data files that require processing to organize the data into a usable form. .. occasional “view of the day” sections illustrate how selected key multi-sourced demographic-economic data can be brought together focusing attention on the school district community. 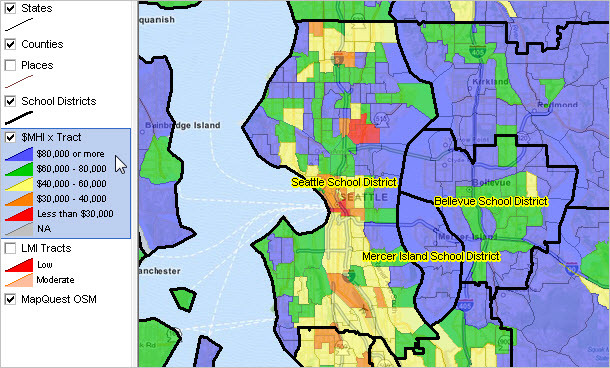 Understanding the demographic-economic characteristics and patterns within and around the district and attendance zones can help leadership and stakeholders better plan for improved educational outcomes. .. ACS 2012 5-year median household income for district overall: $63,445. View developed using CV XE GIS and Washington DMI GIS Project. See related Seattle community profile. See related King county projections to 2020. The Seattle school district is ranked 87th among the largest school districts in the U.S. based on 2013-14 school year enrollment. See more about the largest school districts.